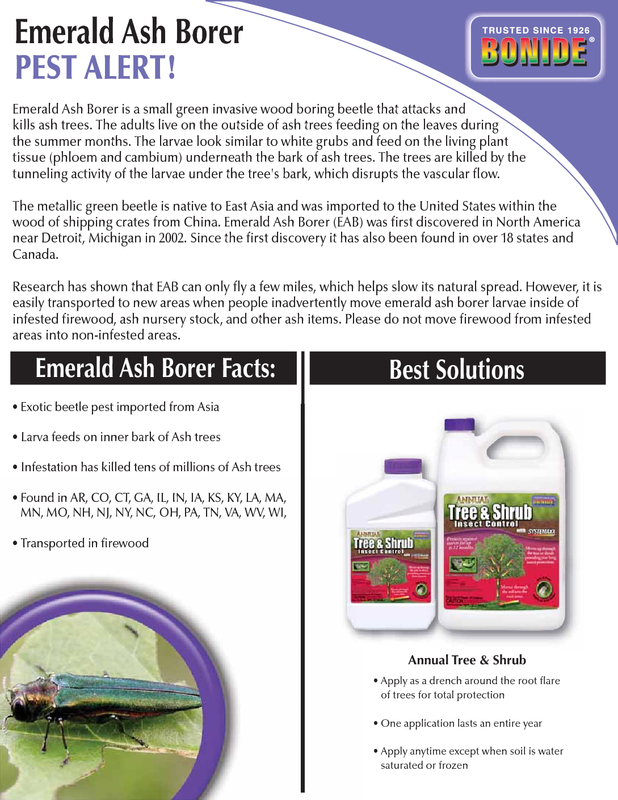 You are here: Home / Blog/News / Blog / News / Emerald Ash Borer Alert! We’ve recently received phone calls from people having issues with their Ash trees and looking for a remedy or solution to the Emerald Ash Borer insect. Many gardeners & arborists are already aware of the Emerald Ash Borer, but for those of you who do not, please take the time to read the Pest Alert below. Here at Herbein’s, we do not stock the Ash tree. Bonide has provided a pest alert with a treatment option for homeowners having found themselves with this concern. We carry these products on our shelves. Bonide is a trusted company with having spent over 90 years creating chemical based, and natural or organic products for use on your garden and lawn.